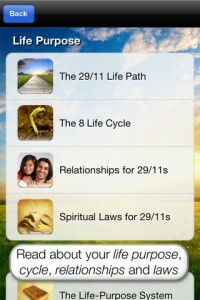 Peaceful Warrior Life Purpose App iPhone App Review. While I personally don’t care much for books, pamphlets or any digital publication that prides itself on knowing my own life better than me, it does make me wonder how is it that I always seem to find myself within those pages that deep down I know are not written about me or my life. I guess it’s one of those metaphysical questions that I won’t dare to venture to answer, for the sole reason that I truly believe that I am the only one who can change for the better or for the worse, and that outside factors are as important as I want them to be. That is not to say that I’m completely disregarding everything that says otherwise, and today I decided to give one such app a try and perhaps share some thoughts on it. 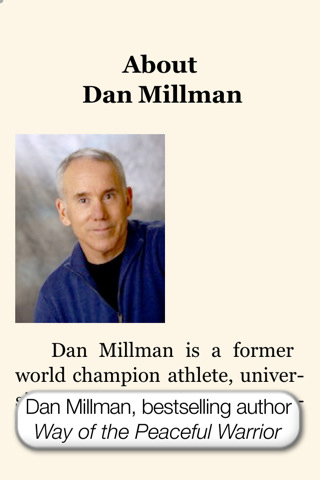 Dan Millman’s best-selling book - “The Life You Were Born To Live” - comes accompanied by an iPhone app - Peaceful Warrior Life Purpose App, and since I love iPhone apps, this seemed like a good way to start my day. I should start out by saying that Millman owns a hefty resume. He’s published thirteen books in over 29 languages, and he’s devoted to writing, speaking and staging seminars and workshops. Up until this app, I haven’t had any contact with him or his work. The iPhone app Peaceful Warrior Life Purpose App gives you full access to Millman’s book, but the core of the app is about finding your own life path, relationship path and life cycle. The first step to this is to enter your full birthday. What the app will do next is add up the numbers of your birthday and, “miraculously,” give you insights into your life, including core issues, inborn talents, health, money or sexuality. These insights are categorized into 4 chapters: the life path, the life cycle, relationships and spiritual laws. Each chapter is worth reading. As I’ve said, it’s amazing how I’m able to find myself into these writings. This app is no exception. 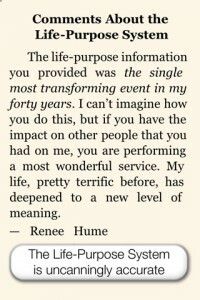 The Life Path chapter provides the most insight. It’s nicely structured on sub-chapters covering health, relationships, talents and the all-important life purpose. I won’t bore you with all the intricate details of my own life, but one aspect that I found particularly interesting is that the app will tell you well-known people that share your own “destiny” so to speak. In my case, I was surprised to learn that Nat King Cole, Sigmund Freud, Hugh Hefner, Paul McCartney or Babe Ruth, to name a few, shared my life path. To further demonstrate its predictive capabilities, the app will ask you to select your partner’s birthday and offer relationship advice and laws to guide you through shared-life with your partner. 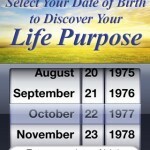 Depending on your birthday, various spiritual laws will apply to your life. You might have figured out by now that the app is a lot about reading. Being such as it is, the app is perhaps more suitable for the iPad, but it’s nothing to worry about, even with the iPhone’s smaller display. Navigating the various chapters is easy. Just double tap on the screen at any point in the reading, and it will bring up the navigation menu, with options to search the text, write notes, and select various settings to ease your reading. Swiping left and right will get you to the next and previous pages. 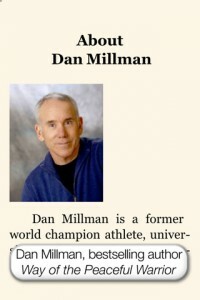 Dan Millman has his own unique look on human energy and its connection to numbers is what ultimately powers the iPhone app. In the end however, it’s all up to you if you want to believe his words and perhaps put them to good use in your own life, or just ignore them. The iPhone app also fully integrates with both Facebook and your Address book. 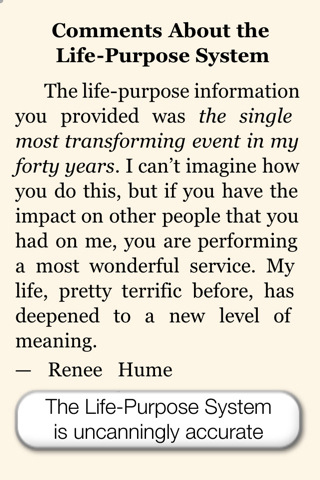 So you can easily read all about your friends’s life purpose, so long as you have entered their birthday in your Address book. The Life-Purpose System explores key spiritual laws that are meant to help you clarify the past, understand the present, and shape your future. Peaceful Warrior Life Purpose App provides some interesting insights into life itself, and depending on how firm your own beliefs are when it comes to such predictions, you might change a few things in your own life, or completely disregard the app altogether. 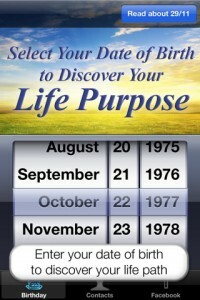 What do you think of Peaceful Warrior Life Purpose App ? Scroll down for our comment section.